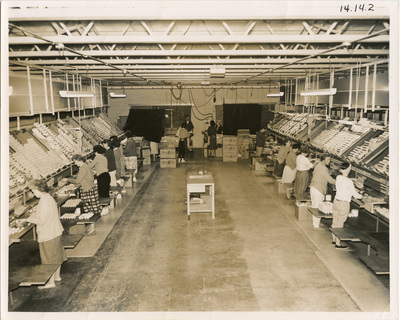 "Candling Room at Maine Egg Producers"
The candling room of Maine Egg Producers as it was in the early 1950's. The women would twirl four eggs at a time in front of a light. Eggs that had blood spots crack, or were old were rejected.